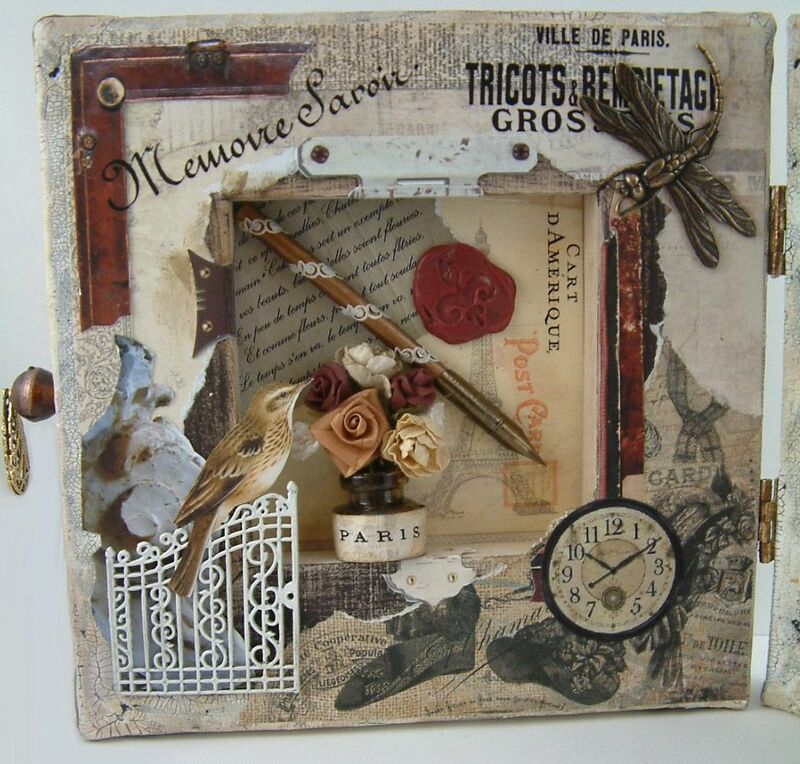 This project started with Leslie of Alpha Stamps sending me a picture of the French Kiss 6x6 paper pad and asking me if I would like to create something using these papers. I said “YES”! These papers are so up my alley. Next, I had to decide which images I would use as a focal point and I couldn’t resist using the Cléo de Mérode collage sheet. Her images are some of my favorites. With the papers dictating the style and with Cleo as my muse, I decided to make a vintage French book from two painter’s canvases. I love using canvases because the wood frame on the backside creates little niches that you can fill will all kinds of goodies and it’s really easy to hinge the canvases together. I started with two blank 6” x 6” painters canvases. You can use any size you like just make sure that wooden frame creates open spaces in the back. Some really small canvases don’t have much of a niche in the back. Before you hinge the canvases together, paint, stain, ink, paper etc. all of the edges on both canvases. If you want to paint, stain, ink etc. the entire surface of the canvases, go ahead and do that now, but don’t add any dimensional objects to the front or back of the canvases until they are hinged together. Creating bulk at this stage makes the hinging process more difficult. I decided to use a vintage aging technique on the edges of the canvases and paper for the front and back of the canvases. 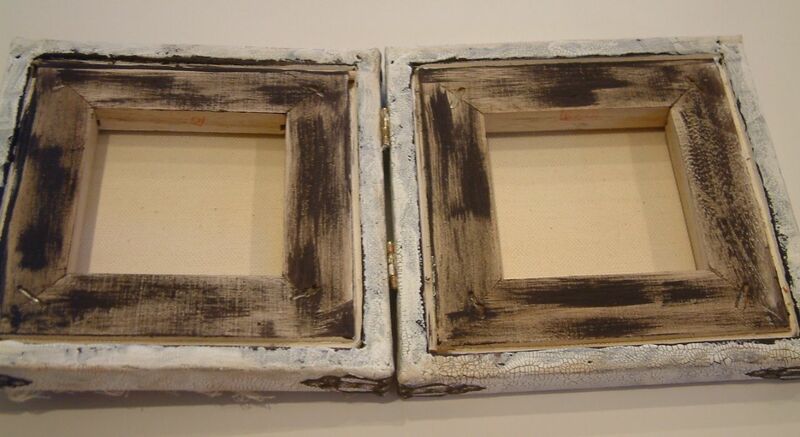 Once you finish decorating the edges, hold the two canvases together with the niches facing each other (backsides of the canvas facing each other). You can see in photo below there is a slight gap between the canvases. When you decorate the edges and backsides of the canvases, it creates a little extra bulk. Having a slight gap insures that the book closes properly. With the canvases held together (with a slight gap), place your hinge or hinges along spine of the canvases (as in the picture below). The number of hinges you use depends on the size of the hinge and the size of the canvases. 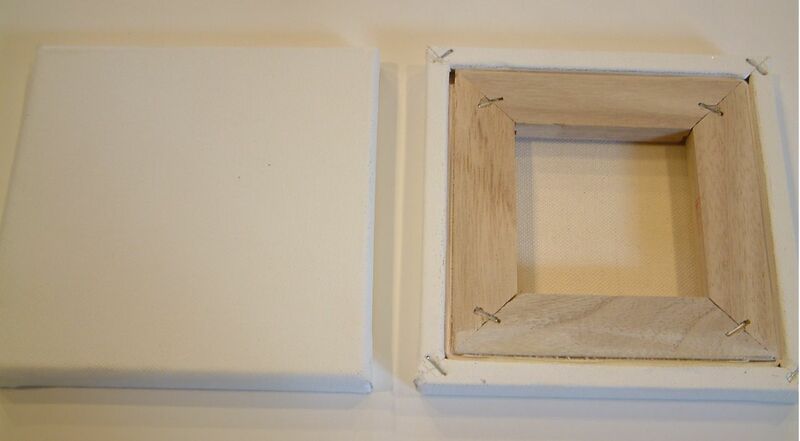 I used two hinges that are 1/2” long by 5/8” wide and the center of the hole is 1/4” from the edge of the canvas. 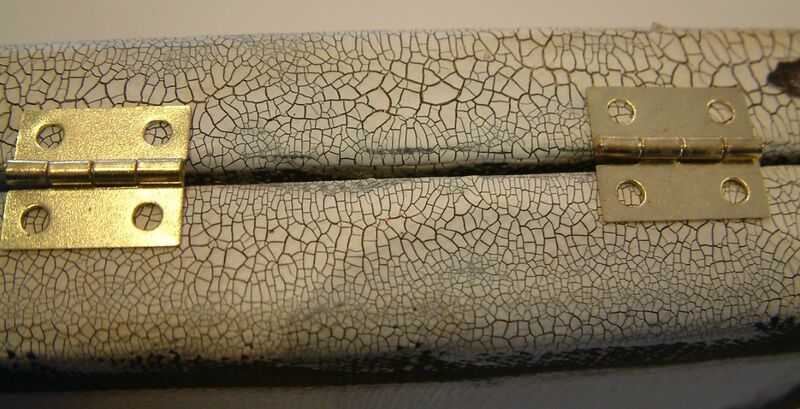 Using a pen or pencil mark the placement of the hinge holes. 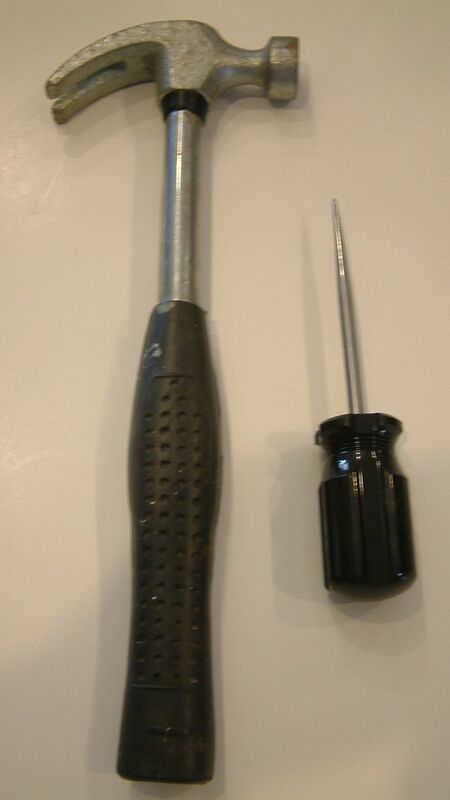 Remove the hinges and pre punch the holes using an awl and hammer. Pre-punching makes it a little easier to insert the screws. Screw the hinges into the canvases. Don’t use nails or glue as they will not hold. 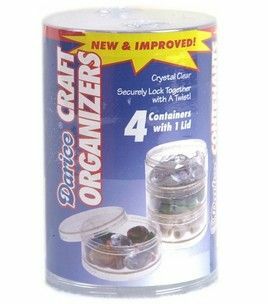 If the hinges you purchase don’t come with screws you can purchase tiny screws at any hardware store. 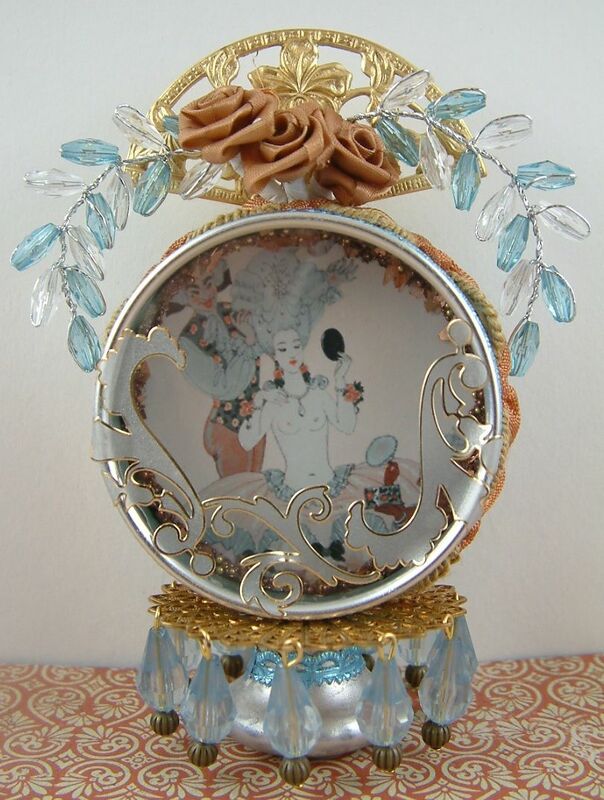 The embellishment at the corners my canvases are images of vintage jewelry. After you have hinged the canvases together, I suggest decorating the inside of the canvases first. If you start with the outside of the canvases they won't lay flat on your work surface when you get ready to work on the inside, making it harder to paint, ink, apply rub-ons, paper and other embellishments. On the inside of my book I dry brushed brown paint on the wood frame. 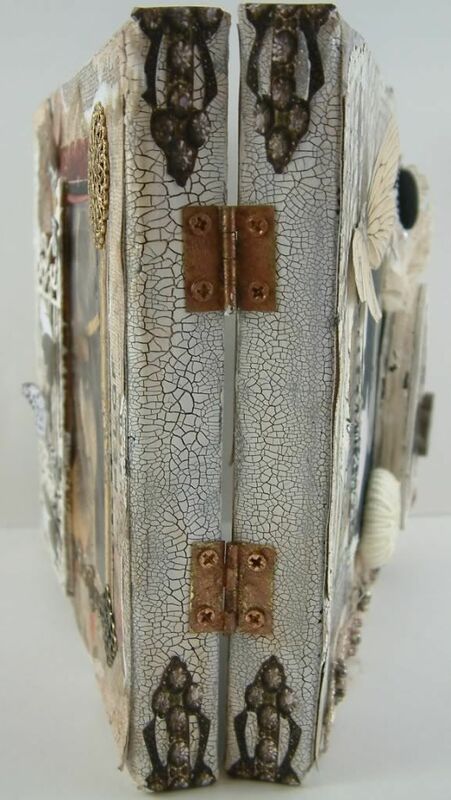 To the inside surfaces I added decorative paper, paper images, rub-ons and flat metal embellishments. I kept the elements I added to the outside edges as flat as possible to make it easier to close the book. 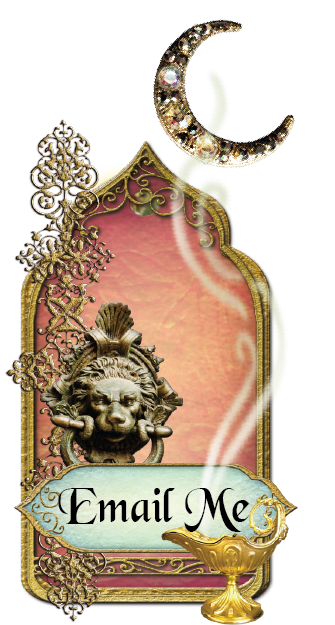 In the niches I added the bulkier elements like a mini glass inkwell, a pin nib attached to a wooden skewer, a wax seal, flowers and a metal frame and gate. The key to creating the look of this book is lots of layers. I decided to use paper as my base layer for both the front and back covers. I started by choosing two papers from the French Kiss paper pack. 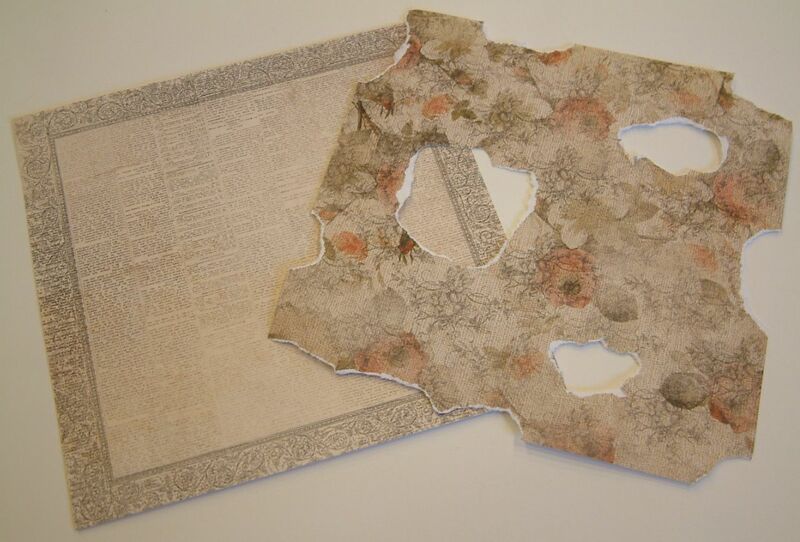 I tore holes in the middle and sides of the top paper then glued the papers together. 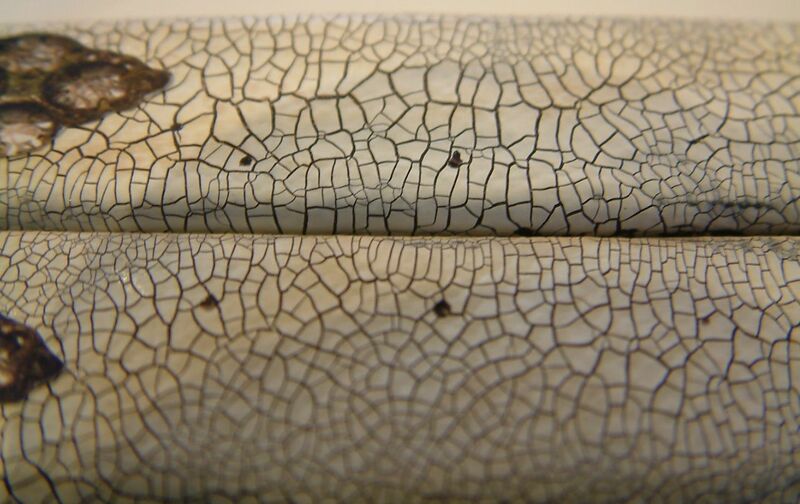 This technique allows the paper on the bottom to show through the paper on the top and gives them a worn look. Then I used a technique to make the paper look even more worn and tattered. 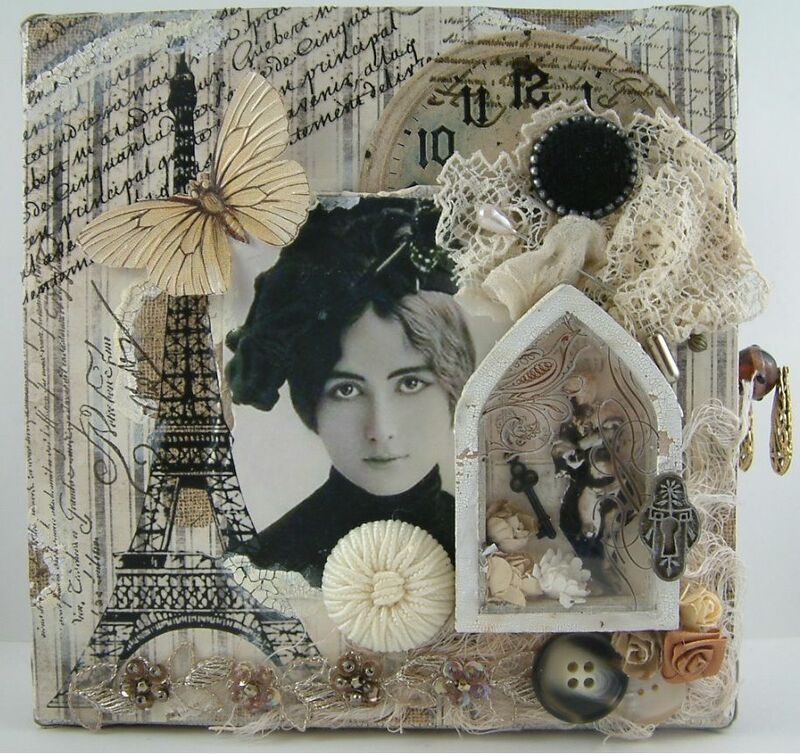 For the next layer I added the focal point image (Cleo), a paper clock, various rub-ons (French writing and the Eiffel Tower), and rubber stamped designs and writing. 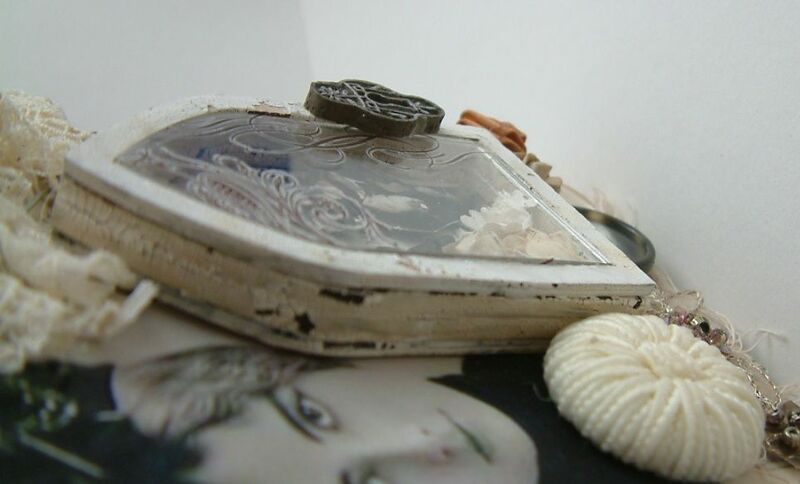 The next layer consisted of dimensional items such as died cheese cloth, buttons, vintage lace, decorative straight pins, flowers, beaded trim and a butterfly. Lastly, I added the Shadow Box Shrine. I used a distressing technique on the frame and applied rub-ons to the glass. 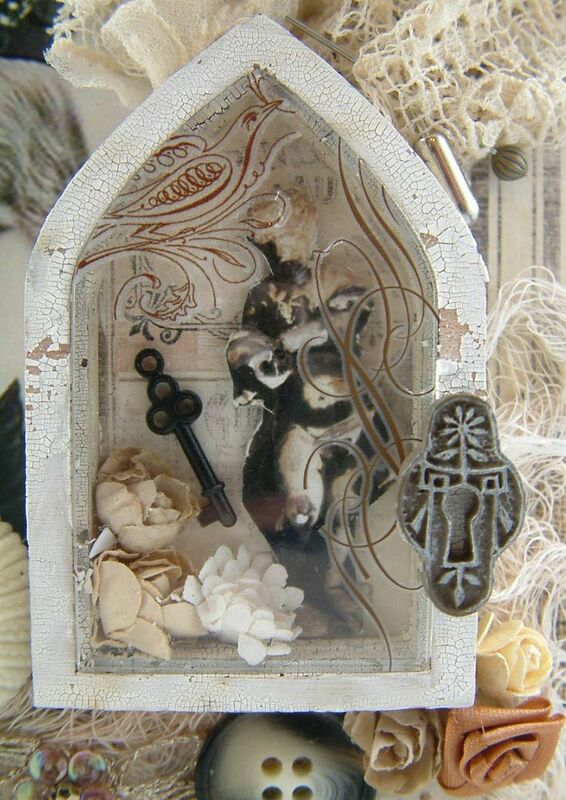 I backed the inside of the shrine with the French Kiss paper, then added an image of a weathered statue, paper flowers and a key. The final touch is the key hole of the front. After assembling the décor for the front cover, I glued it to the canvas and married the distressing technique I used on the edges of the canvas, to the edges of the paper on the front cover. Just as in the front cover, I choose two papers from the French Kiss Paper pack, tore holes in the middle and sides of the top piece of paper and glued them together. 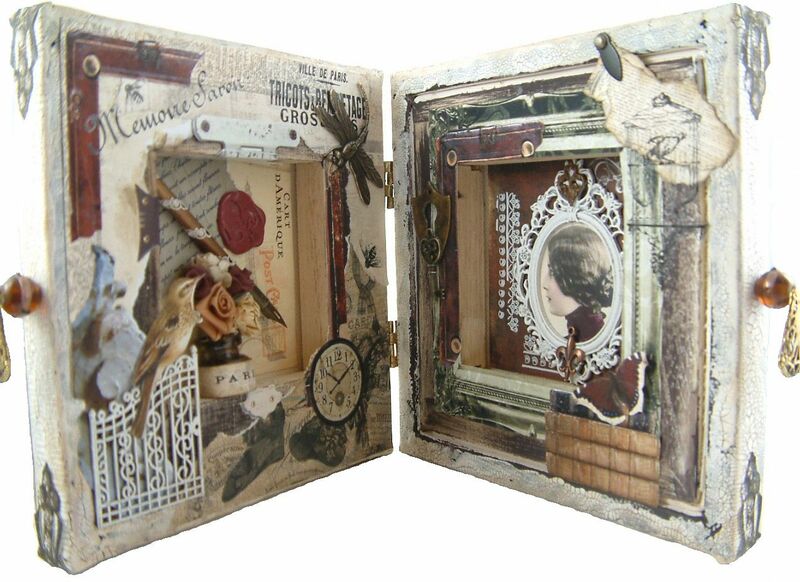 I added the focal point image (Cleo), paper images, rub-ons, lace, a wooden gate and pieces of filigree. Once the décor for the back cover was assembled I glued it to the canvas. 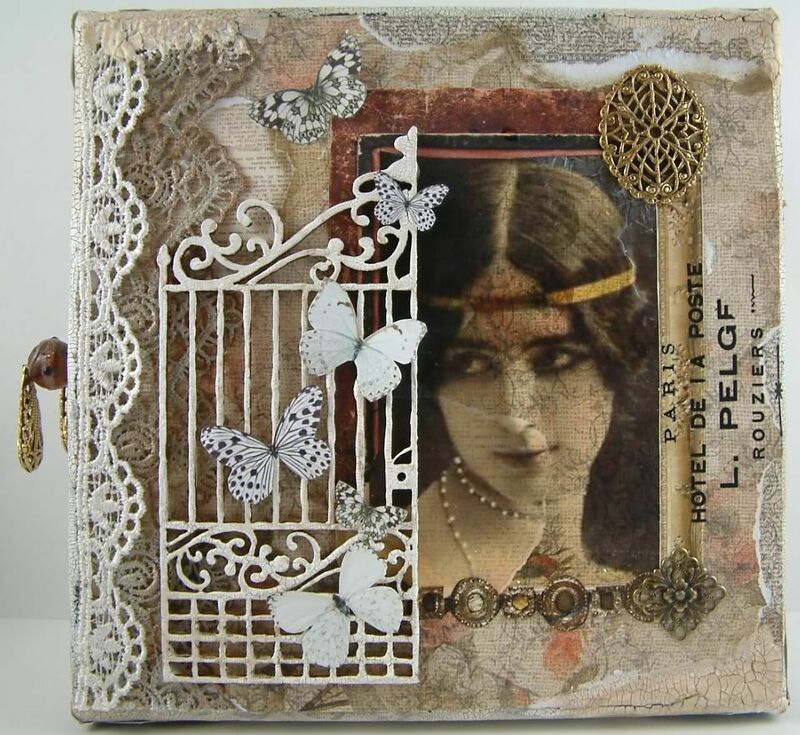 The image of Cleo is a rub-on I made using the Alpha Stamps Cleo Collage Sheet. Click here to see the tutorial on how to make your own rub-ons. 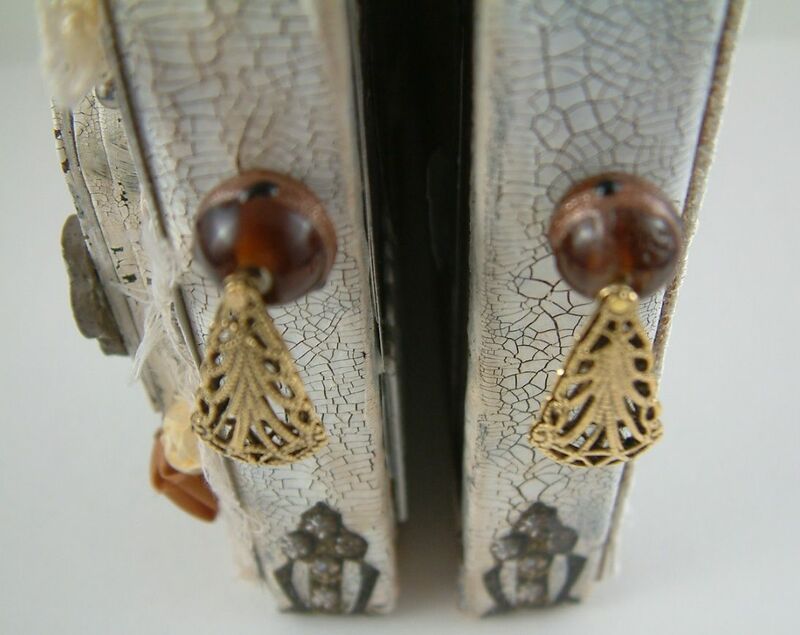 On the edges where the book opens I added beads with filigree drops. I used the awl to poke holes into the canvas. 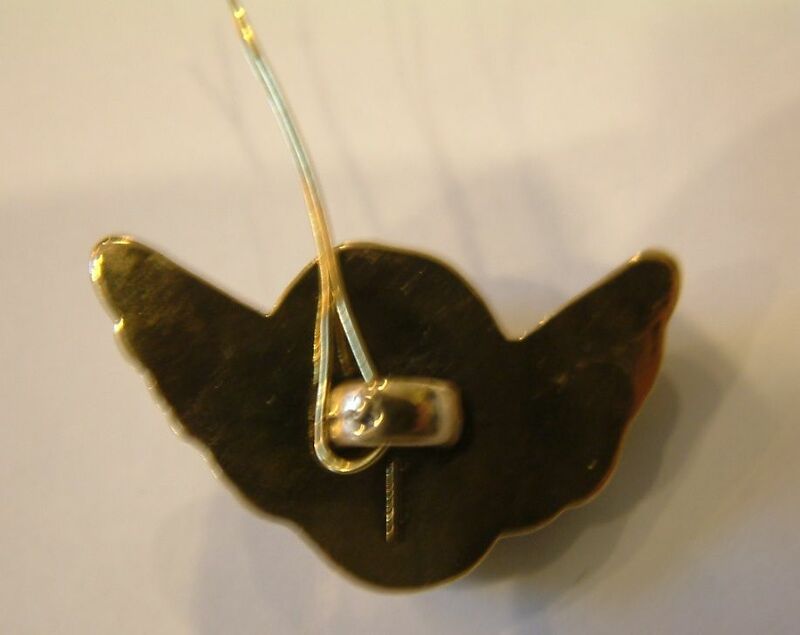 Next, I inserted a metal pin through the filigree drop and bead, and glued the end of the pin into the hole. I know you are going to want to know all about the aging and distressing techniques I used and referred to in the tutorial. Well stay tuned as all will be revealed! 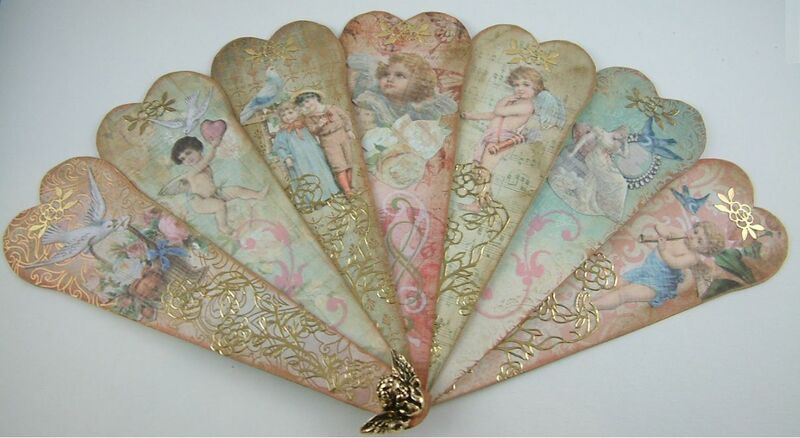 Below are a series of vintage fan images. You are free to use these in your art. The images have a transparent background so you can layer them on other images. To download an image, click on the image to expand it, right-click and select Save As. If you missed the first set of fan images click here. 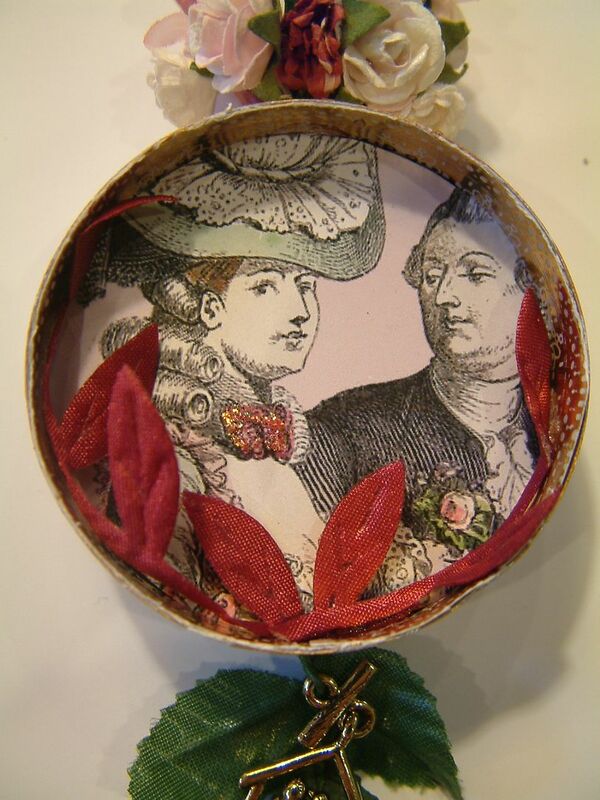 I made this button brooch for a swap in the Marie Antoinette Mail Art Group hosted by Melanie Hall. The overall dimensions are approximately 2” x 3”. 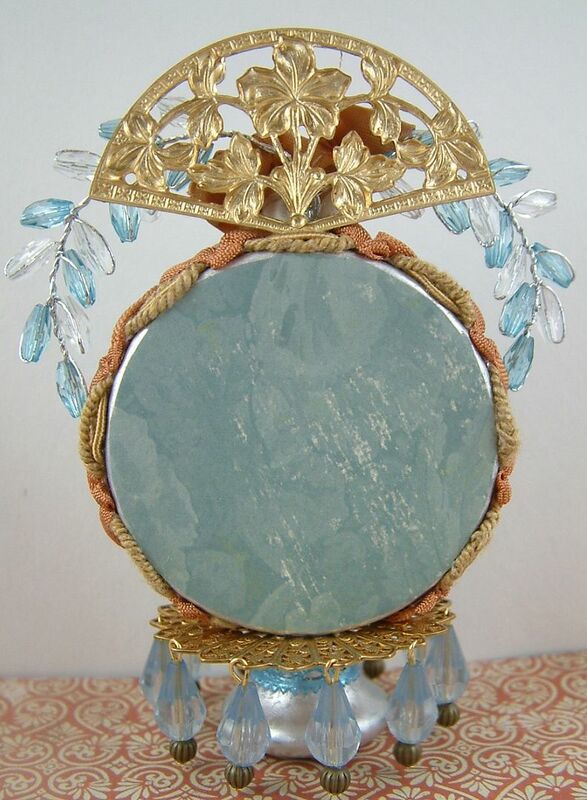 The base of is made from pieces of filigree. 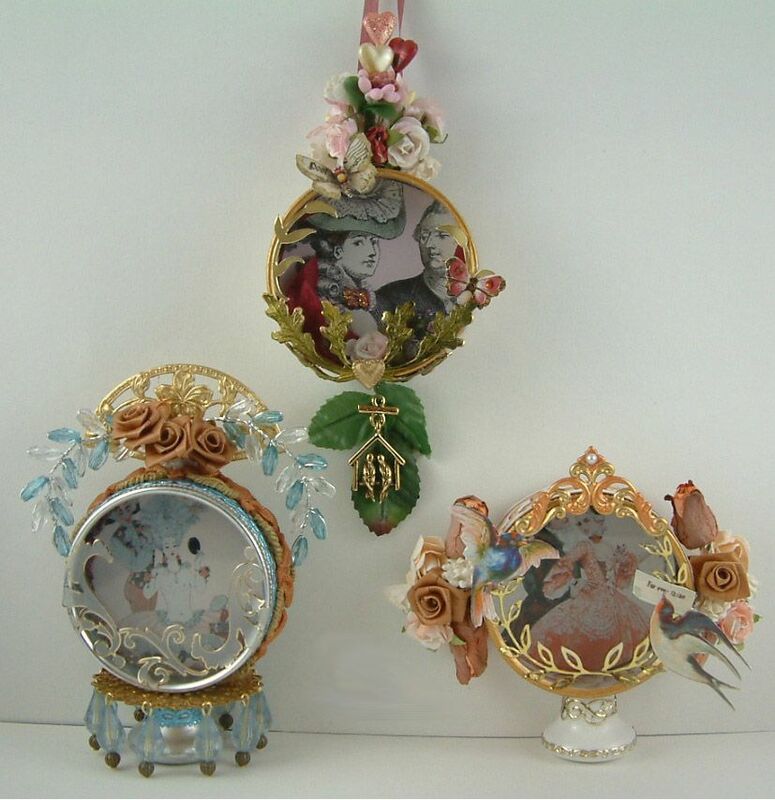 Then you collage buttons and other metal pieces, pearls, jewels etc. 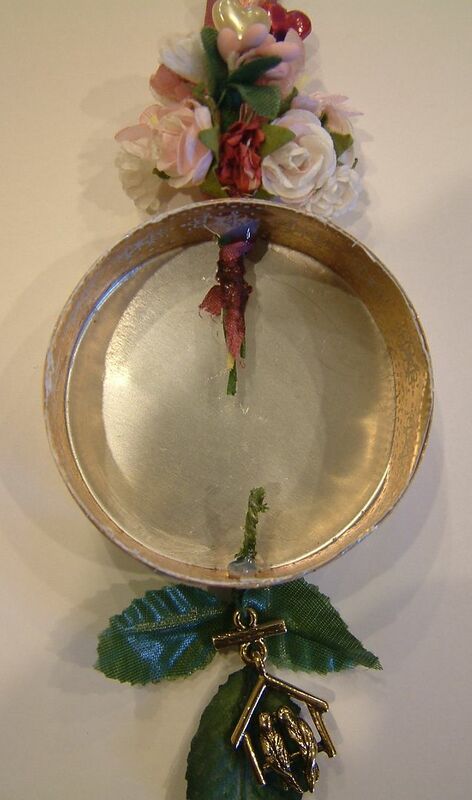 It has a pin back so you can wear it or attach it to a purse, pillow, fabric box etc. You can see my some of my design process below. I first drew a box on paper to indicate the maximum size the piece could be (according to the swap rules). 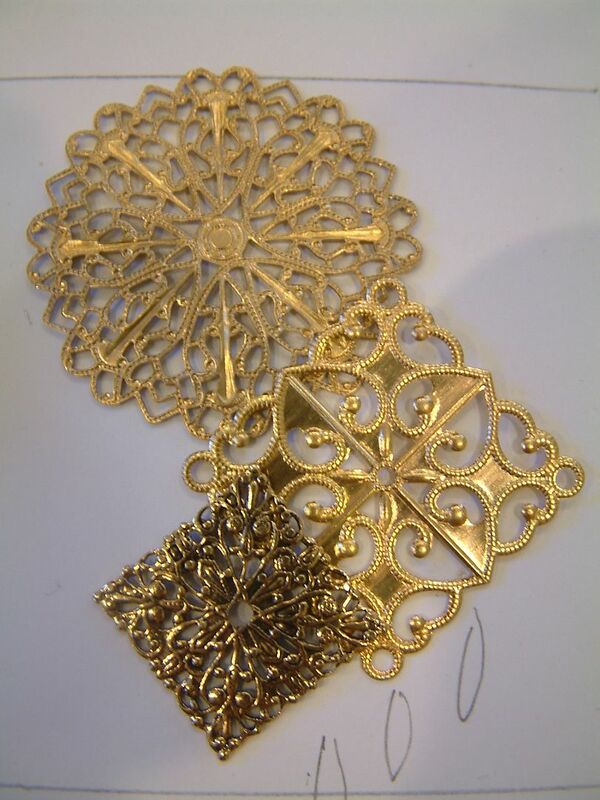 I then laid out the filigree. I knew that I wanted something dangling from the piece so I drew in some pearls. Many times when I am designing a piece of art I will do a crude drawing first. On paper, I consider dimension, balance and composition. Then I start laying out the design. If I am really pleased with the design and if it has lots of layers and components, I photograph the design before pulling it apart to permanently reassemble the piece. That way I’m usually pleased with the end result. 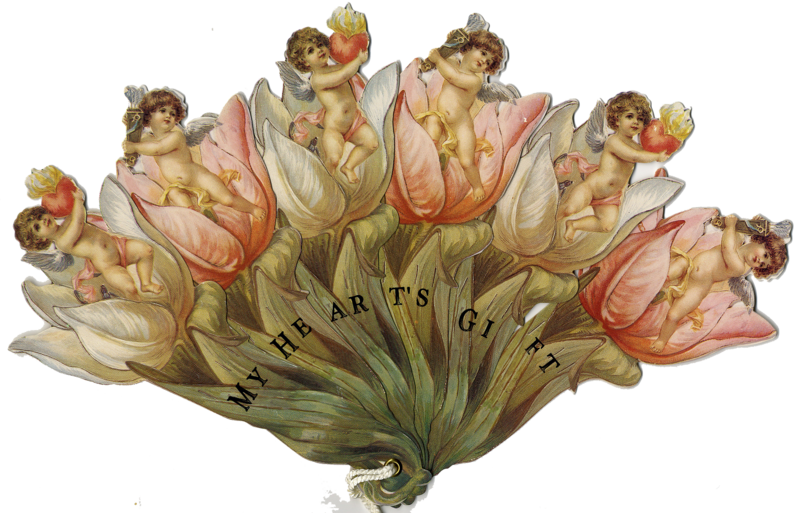 The overall dimensions of this piece are 7 ½” x 3 ½”. My design process started with the mask at the top. After assembling it using various metal bits and pieces, feathers and glitter I then moved on to deciding how to use it. 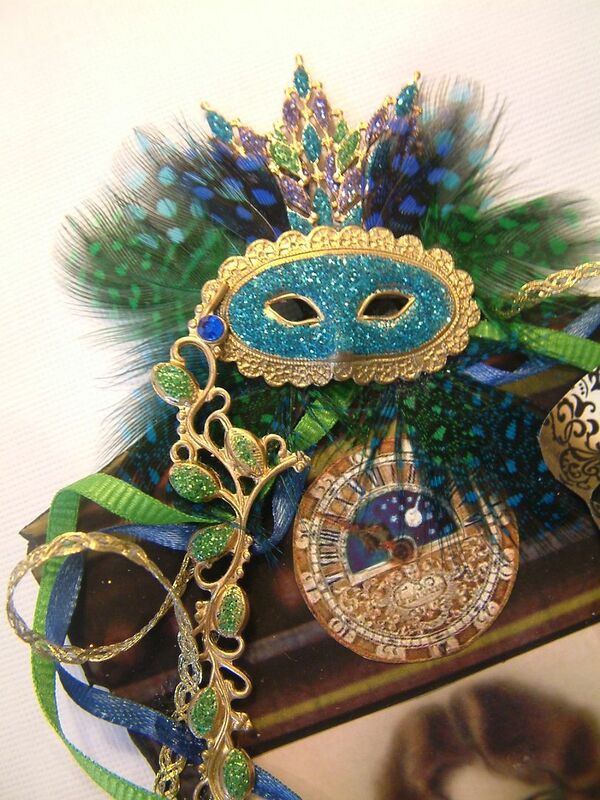 The mask has been sitting on my worktable for several months waiting to be used. I’m happy to have finally done something with it. 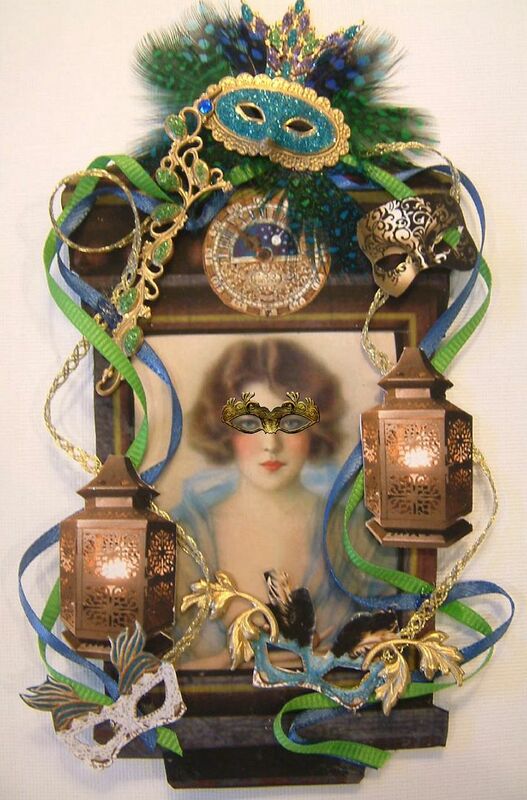 With Mardi Gras fast approaching I’ll be posting some carnival themed art over the next week. This first piece is something I designed for Alpha Stamps. The top and the bottom are made of plastic craft organizers connected by wooden skewers. The hanging windows are German Scrap. 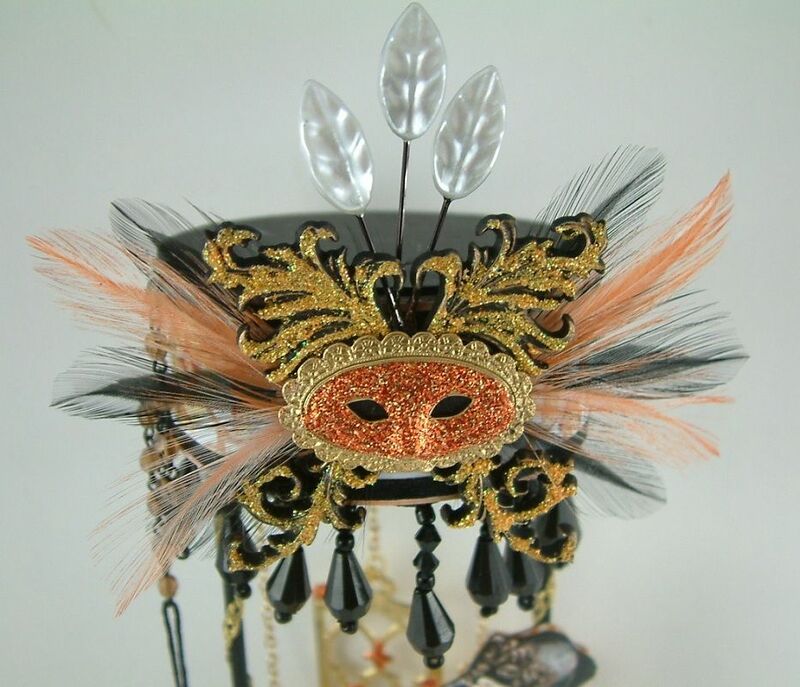 The mask is made from a combination of feathers (I dyed white feathers orange using Ranger Alcohol Ink), Stamped Flourishes to which I added glitter, a gold brass mask to which I added glitter and white leaf stickpins. 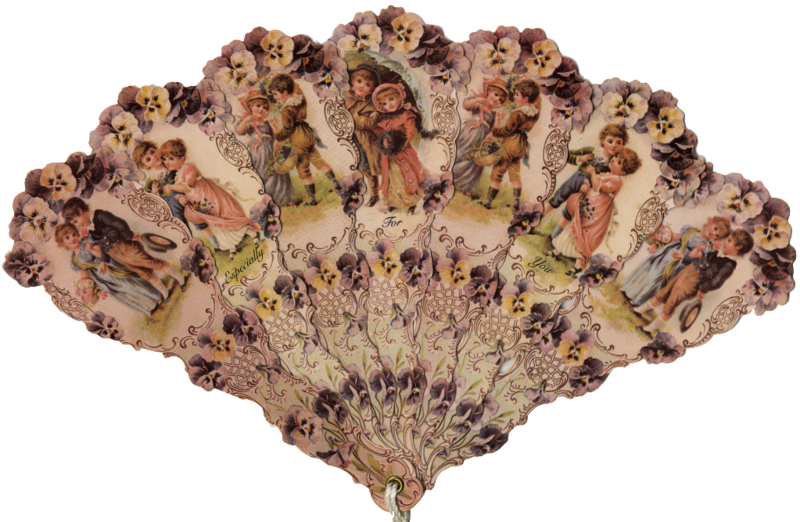 This is a fan I designed for Alpha Stamps. I started with triangular shaped blades. The front paper is Love Letters scrapbook paper. 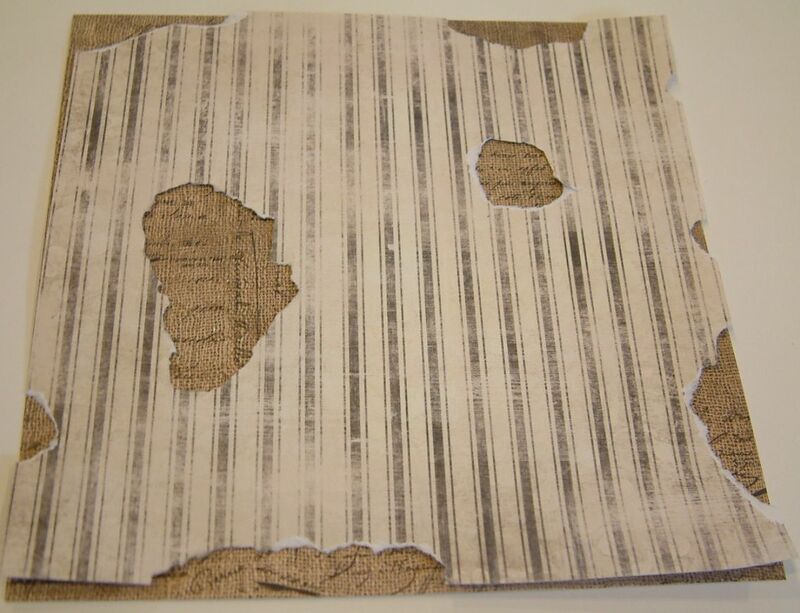 Sandwiched between the front and back decorative paper is a thin piece of chipboard. After assembling each blade I inked the edges. 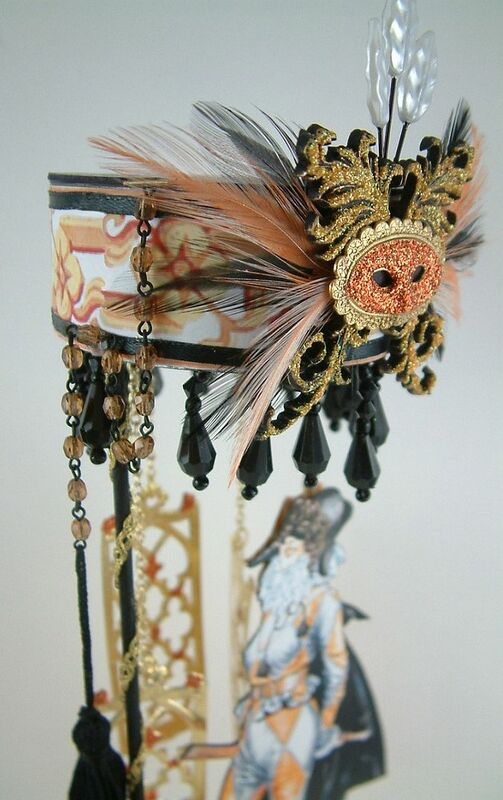 Next, I added Baroque Dresden borders to the ends of each blade (front and back). 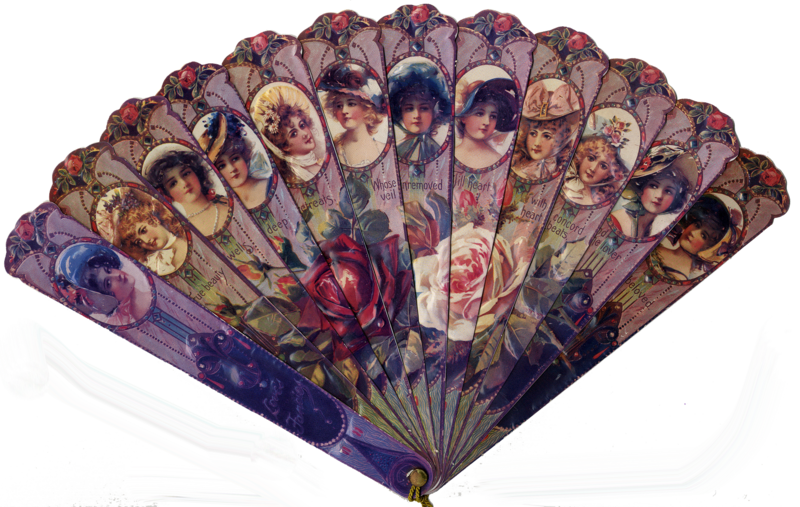 I decorated the blades with images of Marie from three different collage sheets. 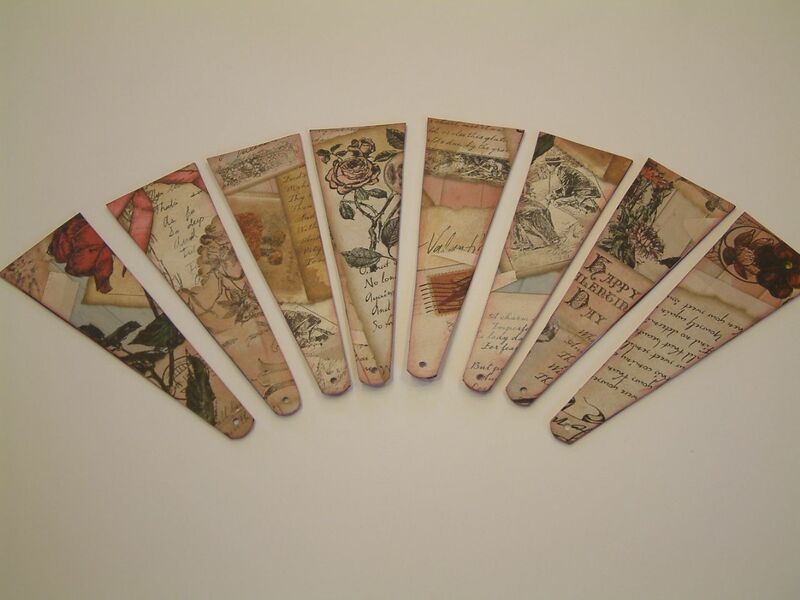 The images are glued to paper from the Timeless paper pad and framed with small Dresden oval frames. 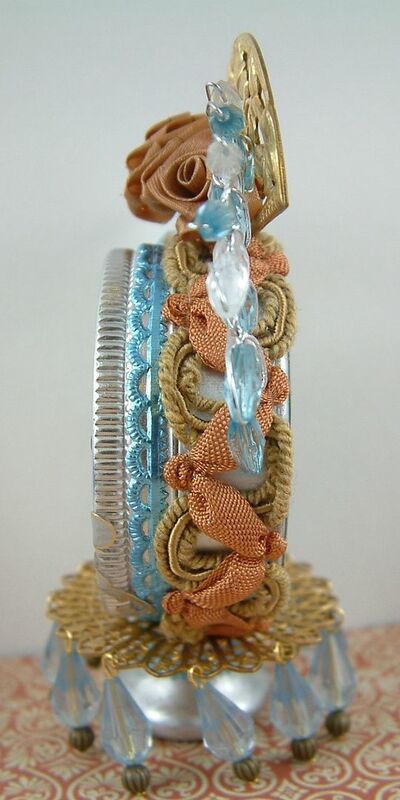 I added images of flowers and more gold German scrap. The blades are secured with a brad to which I added ribbon and beading. I glued a piece of filigree to the brad. I attached ribbon along the back of the blades to act as a stop to keep the blades from opening too far. I glued a piece of paper at the points on the blade where I glued the ribbon to the blade. The ribbon folds between the blades when the fan is closed. 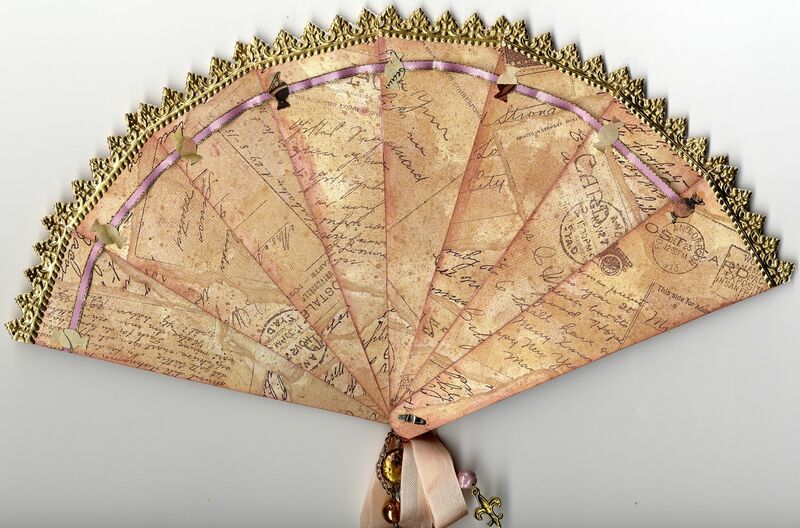 Below is a complete list of the Alpha Stamps products I used to make this fan. 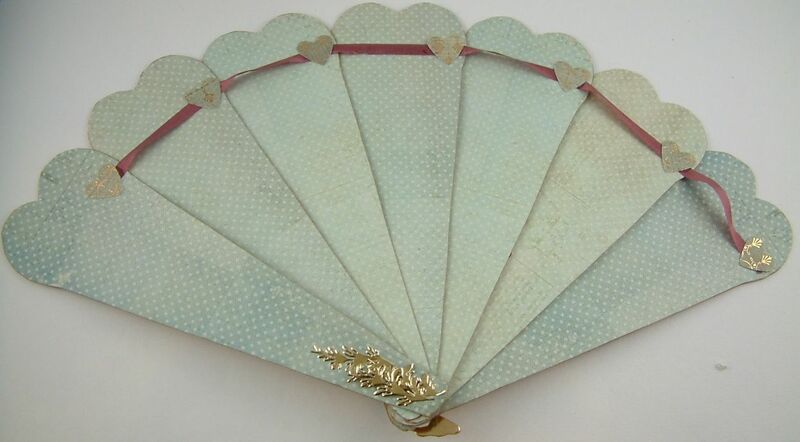 This simple heart shaped fan was made from the Sweet Nothings 6 1/2” paper pack that you can find at Alpha Stamps. The package comes with a variety of pattern sheets including gold foiled paper. It also contains images, tags and borders. 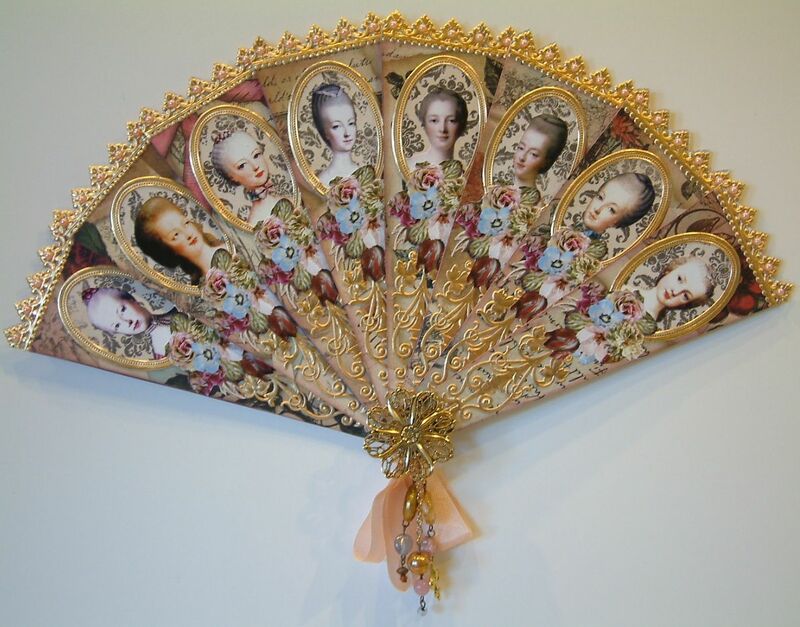 I used the patterned paper for the fan blades and then on each blade I collaged a variety of images from the paper pack. As a final touch I inked the blade edges and added gold stickers and rub-ons. 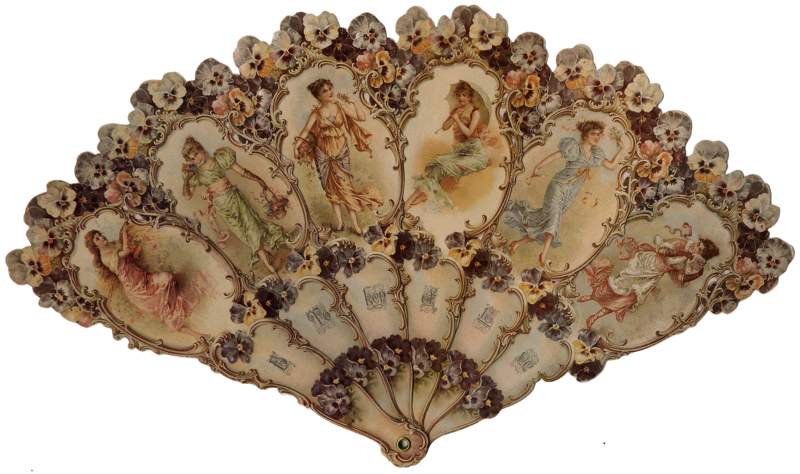 The fan is held together with a cherub button. I threaded a piece of wire through the shank of the button. 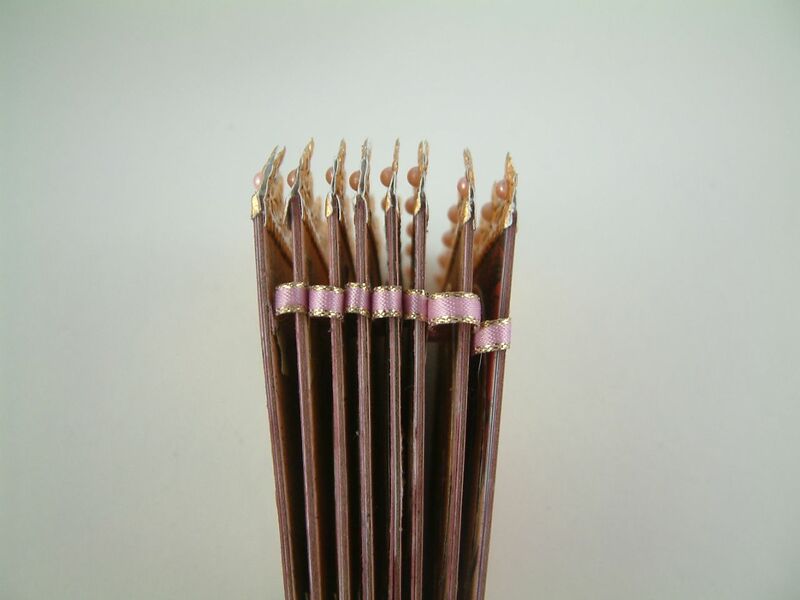 The wire acts as a stop to keep the shank in place. I bent the wire in the back, glued it and covered the wire and hole with gold stickers. Clear here to download the heart shaped fan template. This is the third and final altered tin I made for the “Naughty Valentine Tin” swap hosted by Alpha Stamps. Just like the others I drilled holes in the tin so that I could insert flowers, leaves etc. I added glue (Glossy Accents) on the inside of each hole to keep the embellishments in place. This is the second of the altered tins I’m making for the Naughty Valentine Swap hosted by Alpha Stamps. 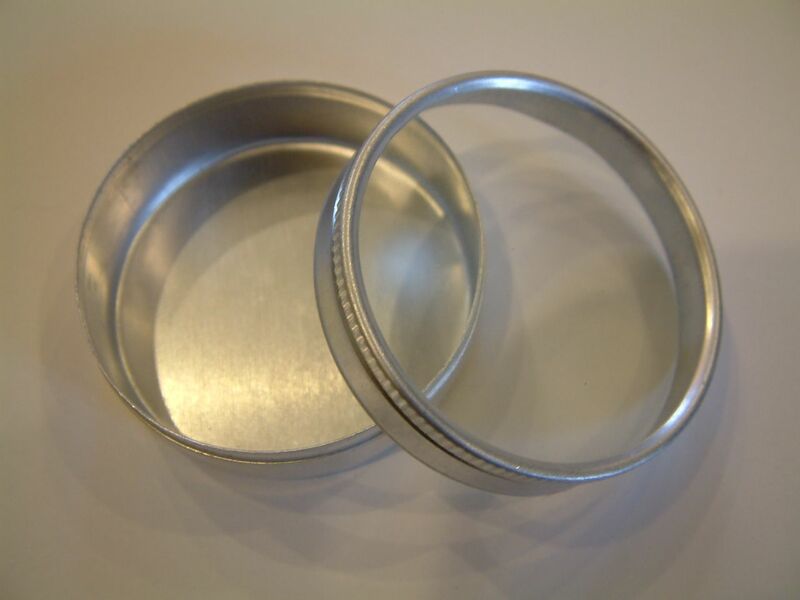 The unaltered tin measures approximately 2” wide by 1” deep. Just as in the first tin I used a drawer knob as the base. I painted it silver and added blue German scrap. 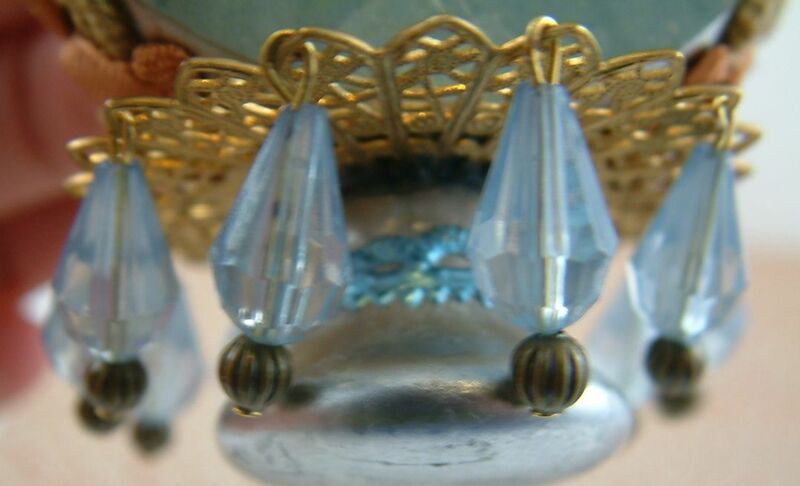 On top of the knob I glued a piece of gold filigree to which I added blue and antique gold beads. I also drilled a hole in the tin just as in the first tin. 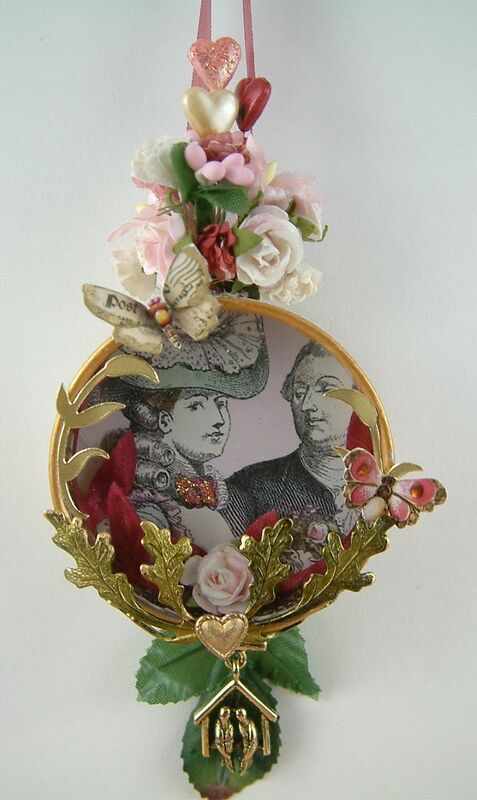 It’s through the hole that I inserted the flowers, beading and fan. 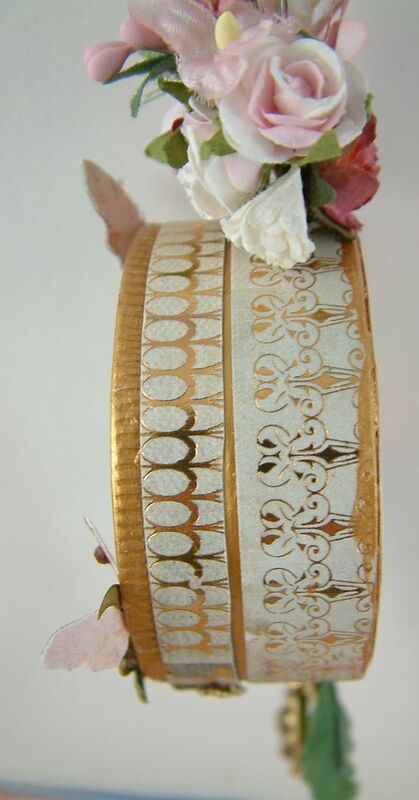 I covered the side of the tin with ribbon trim and German Scrap. 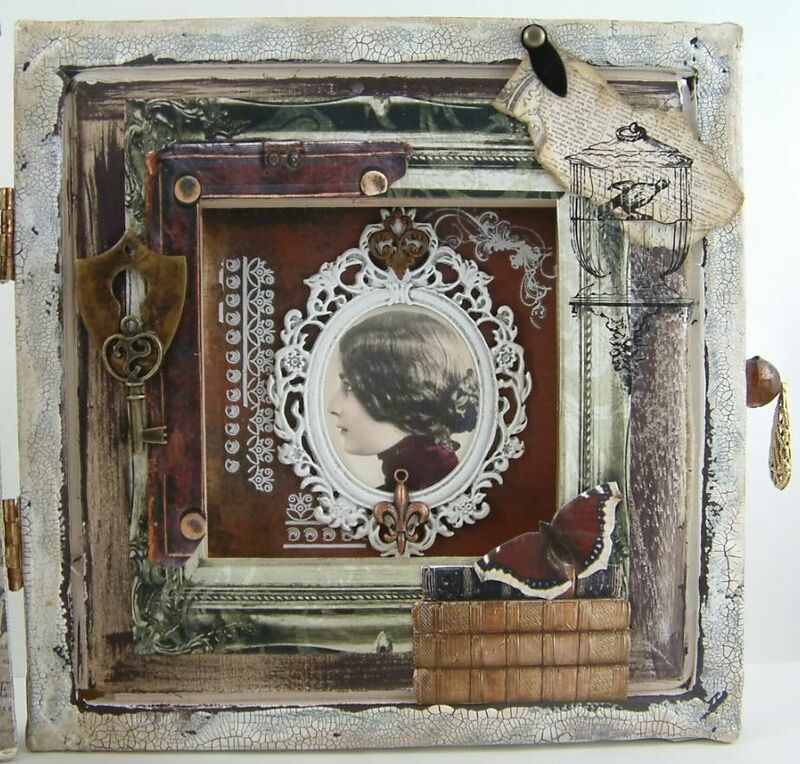 You can find the jeweler’s tin and the collage sheet I used at Alpha Stamps. Below are the links.